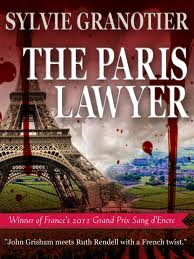 The Paris Lawyer by Sylvie Granotier is a Le French publication released in 2012. I received a copy of this book from the publisher and netgalley in exchange for an honest review. Catherine's mother was murdered when she was child. She was the only witness to the crime. Her father, Doctor Monsigny does what he can to be a good father to her, but mostly the subject of her mother is not broached. As an adult, Catherine is an attorney. She has just been assigned her first big, high profile, murder case. An African woman has been accused of murdering her French husband with poison. The crime takes place in the rural community of Cruese. Creuse is also the area where Catherine's mother was murdered. As a result, her mother is on Catherine's mind a great deal. While in the area, she wants to see if she can discover something more about her mother. She gets a little help from a local journalist. Meanwhile, Catherine is beginning to have vivid dreams of her mother and flashbacks of her childhood. Catherine is also dealing her odd relationship with a former client. She and Cedric have almost an obsessive type of relationship. Hot one minute, cold the next, but they can't seem to stop seeing each other. As the murder case begins to take shape, Catherine comes into her own as a lawyer. She is steps up to the challenge with confidence. But her mother's murder continues to haunt her. As she begins to fit together the pieces of what happened to her mother, Catherine climbs up a steep path to a truth that will leave you shocked and horrified. The author does an incredible job of leading the reader through two murder cases. Catherine is an independent woman that professionally has it together. But, on a personal note, Catherine has an unusual relationship with her father. His insistence on keeping the past in the past has left Catherine feeling like she can't find peace or closure until she has heard more about her mother and about the day she was murdered. As the author slowly released information to the reader, a real sinister quality takes hold. Catherine is going along with her work, that being her top priority, but with a sneaky suspicion that her lover is not all her appears to be. We begin to worry about who this man is and what are his intentions. There is thick fog, but at times it clears and we get a glimpse of the truth. Yet, I still remained in denial, because the truth was not something I was ready to accept. However, in the long run, we know that Catherine had to face facts and as a result she will now be able to move forward with her life as she never would have if the truth had never been revealed. Catherine is a survivor and she will come through with a clearer picture of herself and finally some peace. A very atmospheric mystery, the locations vividly described, the characters well drawn and the book was just impossible to put down. The best mystery I've read in a long time. As always Anne did a great job with the translation from French to English.